Stunning, timeless and classy eternity band ring. 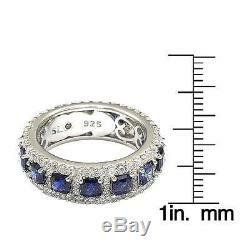 This ring is filled with rich, high quality stones, featuring asscher-cut blue sapphires, prong-set between two rows of white pave created white sapphires, hand set in 925 sterling silver. Every single ring is man made, making it a unique masterpiece. 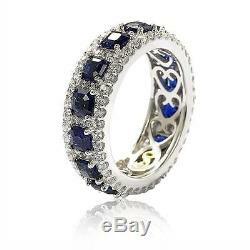 Surprise someone special in your life with this luxurious anniversary ring. Or even better, this could be the perfect birthday gift. 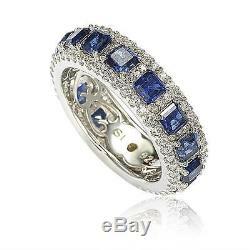 White round zirconia and deep blue asscher-cut sapphires are set in a high-polished sterling silver setting to create a ring that's not only strickingly gorgeous but reminds your special someone that your love will lasts for all eternity. Suzy Levian guarantees the use of only high quality and top of the line materials, delivering for you and your loved ones only the best. This ring is designed by Suzy Levian with a message. By creating jewelry that is beautiful inside and out, Suzy Levian's message is revealed through a hidden brown fancy diamond. 02 ct set in the shank of this ring to empower women to discover their inner strength, power and beauty. This ring has a closed under-gallery for comfort fit with a two-tone setting, highlighting Suzy Levian's yellow gold plated logo. Together we can inspire the world to appreciate the diamond in ourselves. Total Diamond Weight: Less than. Band Width: 2-3 mm, 3-4 mm. Ring Style: Anniversary, Bands, Eternity, Pave, Infinity, Stackable. Size: 8.5, 5.5, 7, 6, 5, 6.5, 7.5, 9, 8. 6 mm wide x 3 mm thick. 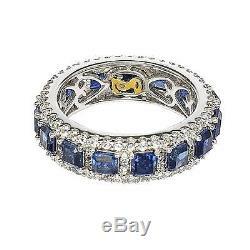 The item "Suzy Levian Sterling Silver Sapphire and Diamond Modern Eternity Band" is in sale since Friday, August 11, 2017. This item is in the category "Jewelry & Watches\Fine Jewelry\Fine Rings\Gemstone". 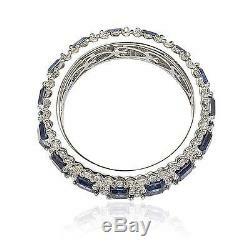 The seller is "farshlove" and is located in Las Vegas, Nevada. This item can be shipped to United States, Canada, United Kingdom, Denmark, Romania, Slovakia, Bulgaria, Czech republic, Finland, Hungary, Latvia, Lithuania, Malta, Estonia, Australia, Greece, Portugal, Cyprus, Slovenia, Japan, Sweden, South Korea, Indonesia, Taiwan, South africa, Thailand, Belgium, France, Hong Kong, Ireland, Netherlands, Poland, Spain, Italy, Germany, Austria, Israel, Mexico, New Zealand, Philippines, Singapore, Norway, Saudi arabia, United arab emirates, Qatar, Kuwait, Bahrain, Croatia, Malaysia, Brazil, Chile, Colombia, Costa rica, Antigua and barbuda, Aruba, Belize, Dominica, Grenada, Saint kitts and nevis, Saint lucia, Montserrat, Turks and caicos islands, Barbados, Bangladesh, Bermuda, Brunei darussalam, Bolivia, Ecuador, Egypt, French guiana, Guernsey, Gibraltar, Guadeloupe, Iceland, Jersey, Jordan, Cambodia, Cayman islands, Liechtenstein, Sri lanka, Luxembourg, Monaco, Macao, Martinique, Maldives, Nicaragua, Oman, Peru, Pakistan, Paraguay, Reunion, Bahamas.